* The technique breaks easily—for example, when images are disabled or if the replaced image has transparent regions. * It’s too complex to be implemented rapidly and reliably. * The technique may be incompatible with some browsers. The method I present here hits 8 out of 9 of these requirements. This was what I was hoping to find in my review. I found the best method to be Leahy-Langridge (LIR) but it doesn’t include, in the presentations I saw, the ability to set the header up as a link. In my review I’d managed to overlook this important detail until I came to set my WordPress blog up to use LIR and found the H1 logo was no longer linked properly (if you’re pernicious you can find it with some mouse waving). 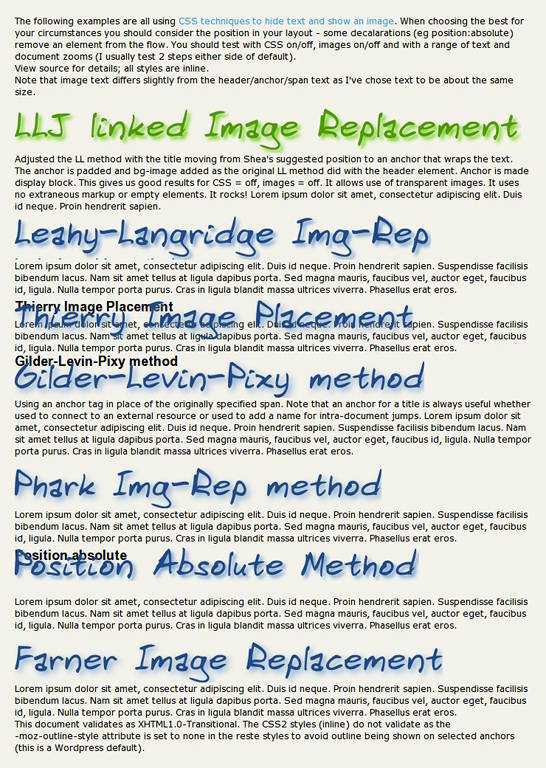 First I implemented all the methods of the review in an example page with examples of LIR, TIP, GLP, Phark, Position-Absolute and Fahrner image replacement as well as a first stab at a better IR, called LLJ, which is basically LIR with an anchor tag stuck in. A warning: I can’t guarantee these implementations are correct, I may have missed some nuance or other that renders one of these a better IR than I’m presenting here. Please comment if you spot an error anywhere. How are the examples deficient? Well clearly (see image) TIP, GLP and Position-Absolute have overlay problems with transparent replacement images, but these are the only ones that present the images as clickable links. 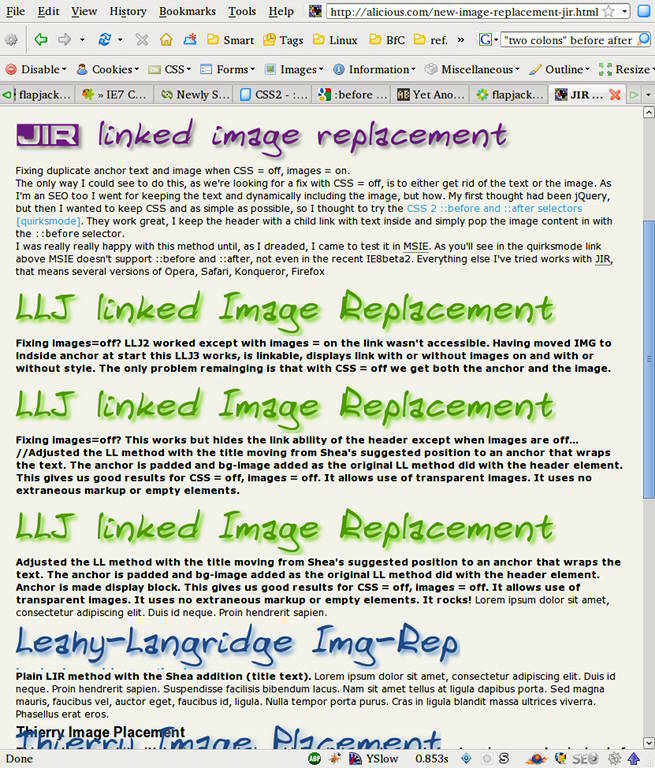 Altering LIR by moving the technique of hiding the image in the padding from the H2 to the A tag, a sort of mix of LIR and TIP allows the replacement image to be clickable. Not quite time for tea and crumpets I’m afraid. This LLJ method has serious problems still. CSS = off works, but Images = off presents no heading and certainly not a clickable one. This is, in my opinion, a very servicable method. If you have same height headers and bump the common code to a class you only have to set the background-image value for each replaced header (which I argue later can be done in the HTML content). 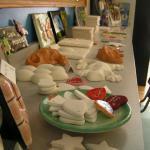 From here I tried several changes which were all successful to some extent. Those alterations and the final JIR technique are shown in the JIR example file, which includes the previous tests, most recent additions are at the top of the examples, I’ll look at them in reverse order here. LLJ – uses the anchor-tag to cover the H2 and provide the replacement image in the background of top-padding. LLJ2 – took the replacement image out of the background and placed it in an image tag in the header, the image and the header are the same size and so, with overflow:hidden, the anchor simply gets pushed out of view. The anchor no longer works. Images = off gives the unclickable image alt text alongside a stylable clickable header. Images + CSS = off gives the same, but sans styles. CSS = off however messes it all up by giving us the header image and the header text side-by-side. It looks bad, keep trying! LLJ3 – we move the image inside the anchor, to make a clickable header image as the default presentation. We’re nearly there it seems, but as with LLJ2 we still have a double header when CSS is off. This leads to the natural thought of what can make the image appear when CSS is on and disappear when it’s off? The CSS2 pseudo-elements :before and :after, can they do it?! The comments there (or in the test CSS file) should be enough to track what’s happening. We actually see that it’s quite close. Now in my opinion linking the header at all times and not displaying a double header if CSS = off are essential. This leaves us with 2 options. Either the JIR method, or the adaptation of LIR+S with clickable anchors that I’ve called LLJ. This is not really unexpected, no not because MSIE is rubbish (!) but because it doesn’t support the :before and :after pseudo-classes as noted by Peter-Paul Koch at Quirksmode.org in his support grid of CSS2 selectors. Elsewhere you can find notes concerning the lack of support for the CSS3 pseudo-elements which now use double-colon notation – ::before and ::after (MSIE doesn’t support any pseudo-elements). End of the [short] road for JIR? You made me read all that and then tell me it won’t work? No. MSIE users still get a styled header, so you could combine this technique with a simple CSS style for IE, or possibly use the IE’s support for downloading EOT fonts (or maybe not). But realistically until MSIE is supporting these pseudo-elements then JIR is not going to be sweeping the web. I hope I’ve shown here that JIR is a positive method that is more accessible, more user friendly, better SEO-wise and better graphically (allows transparency) only let down by browser support. The most common implementation of image replacement across the web appears to be FIR. FIR is seriously lacking and many designers are using the Leahy-Langridge method (LIR). But this too in its default does not include a full sized link element. LLJ keeps the benefits of LIR and adds clickability, keeps semantic HTML and avoids showing a double header when CSS is disabled. LLJ is light-weight only requiring the setting of a per-element background-image over a class. My recommendation therefore is LLJ. It evens works in IE6+ (transparency problems aside, consider sending IE gifs). Thanks for stopping by please feel free to comment or ask questions. For my next foray into CSS image replacement I intend to extend LLJ to implement sprites. 18 Responses to "New(?) pure CSS image replacement technique JIR"
no need to really make a declaration for h2#llj unless you need to position/style it further. It seems to work for me.. and btw, your code uses left bottom for the image which positions it weird in IE 7.. so i changed that to left top. Also. It might not be obvious to everyone, this doesn’t work in IE w/o a valid doctype declaration of HTML 4 or XHTML 1. Mari, thanks for your input. Yes display:block works for non-positioned headers in FF, haven’t tested elsewhere. Will have to check out the left-bottom issue as, because the height is declared, this shouldn’t be different. Hadn’t tested without a valid doctype, I always attempt to be standards compliant. ID and class is to reduce the repetition of code when doing multiple headings. 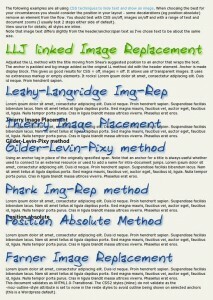 If you keep a fixed heading height then each new heading would only need a background image attribute to be declared. I mentioned the doctype thing cuz I was testing in a shell html file that I hand coded with no doctype and comparing it to your html that I downloaded and was going crazy because one was working and the other wasn’t. 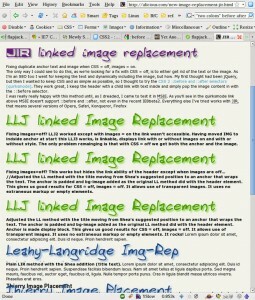 As for the left bottom, it affects both LLJ and LLS (and classic LIR). I assume it has something to do with the padding-top value.. maybe an IE bug? Actually. Sorry to keep posting. But I just figured that left-bottom thing out. IE 7 is positioning the image from the bottom left of the hidden overflow. So if you change the font-size you can see it shift up because the overflow gets smaller. But even with a font-size of 0px, it won’t be positioned perfectly and you’ll lose the readability when you have images off and css on. I honestly don’t think the double header with css & images off is a huge issue. Most sites will break into pieces with images and css off anyway. The images off/css on discrepancy is probably more important, because the headings, both image and text, are missing completely! Also. I know it is not semantically correct. But LIR and Phark can have clickable headings if you wrap the H* with an A tag.. but your HTML won’t validate then, but it is a quick and dirty fix. The css and images off issue is certainly not huge but I was trying to get as pure a solution as possible. Thanks for your input on this – I’ve been busy with other work over the Summer, but along with Fox’s post perhaps it’s time to re-review and get on with the sprites too. What does CT stand for in the results table? Excellent. Best resource I’ve seen on this matter so far.